When you make a donation via paypal it goes to Jeff's paypal account. Jeff then uses this money to offset server costs, buy Nimbus-branded swag, and send beer money to awesome contributors. Jeff recently designed some new stickers! 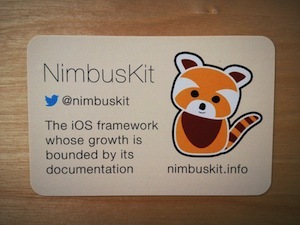 If you'd like to receive some stickers tweet @nimbuskit on Twitter. Every piece of support is appreciated. If you make a donation we'll add your name to the Nimbus donors list.